Home > News > Other News > Why is the Millennial population important to Sandoval County and New Mexico? Why is the Millennial population important to Sandoval County and New Mexico? They became the largest generation in the labor force in 2016, and according to Wallethub, New Mexico is the worst state for millennials. Read the article below from Albuquerque Business First to learn more. Hold onto your avocado toast. New Mexico is ranked the worst state for millennials, according to a report from WalletHub. The financial site looked at 30 metrics when rating states for millennials, from share of millennials to millennial unemployment rate to millennial voter-turnout rate. New Mexico had the fifth lowest average earnings for millennials. The state also tied with five other states for the highest millennial unemployment rate. Washington, D.C., was ranked No. 1 for millennials, followed by North Dakota, Minnesota, and Massachusetts. For the WalletHub study, millennials are defined as people born between 1981 and 1997. On average, millennial workers make $21.80 per hour, $5.78 lower than the national average, according to a report from Paychex and IHS Markit. 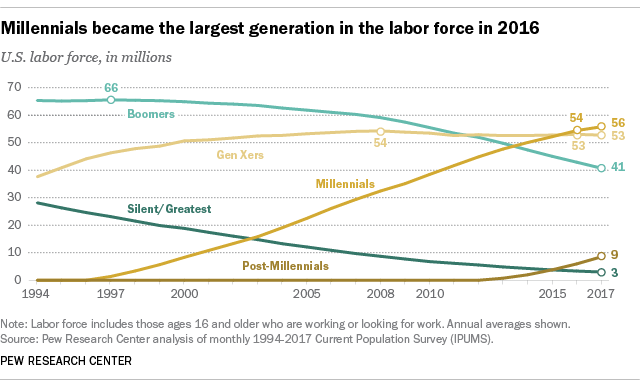 Yet the generation group is responsible for 21 percent of all consumer discretionary spending in the U.S. Studies estimate millennials earn 20 percent less than baby boomers did at the same age. Millennials’ median net worth is $10,090, 56 percent less than it was for boomers, according to a study from the Federal Reserve. Albuquerque ranked No. 91 for millennial homebuyers, according to a study from online loan site LendingTree. Millennials are only expected to grow as the largest homebuying demographic. The largest single-age population in the U.S. is 27-year-olds at nearly 4.8 million, according to LendingTree.